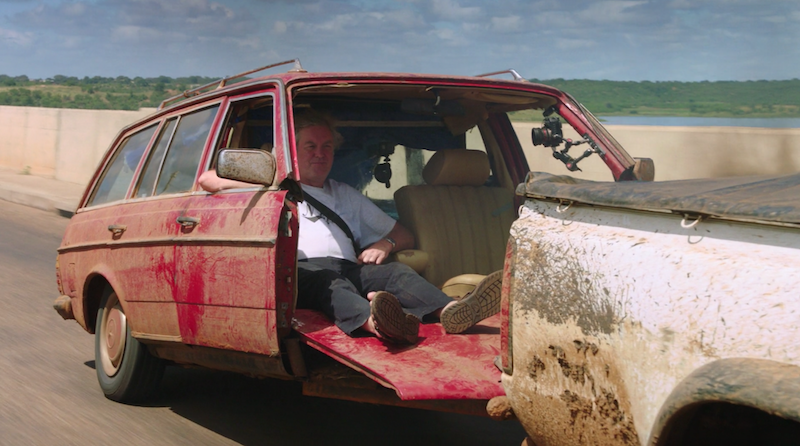 It’s been a fun ride, but I’m afraid to say that The Grand Tour is at its last episode. But it’s ok as it looks to be a good one. This week, the trio head to Mozambique, where they try to do what the likes of Angelina Jolie and Bob Geldof have not managed – solve world hunger. 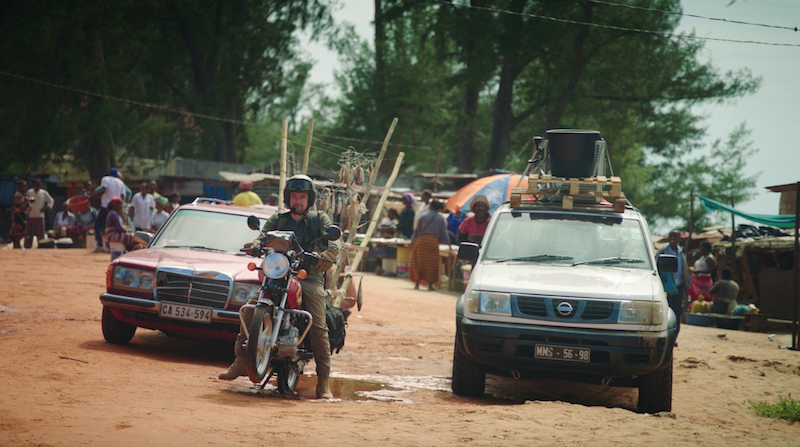 We join the action in the town of Bingo, which, as the trio explain, is not riddled with famine, but at the same time they don’t have the most nutritious meals. 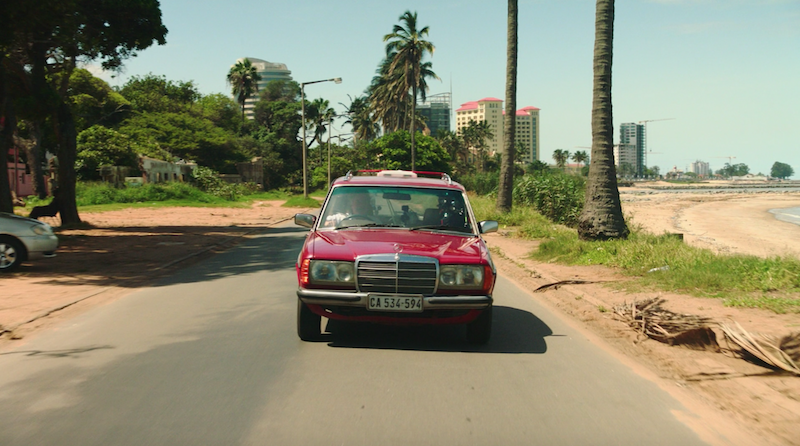 They then cut to the town’s capital, Maputo, which is right next to the sea and therefore has the luxury of seafood, something that Bingo does not. 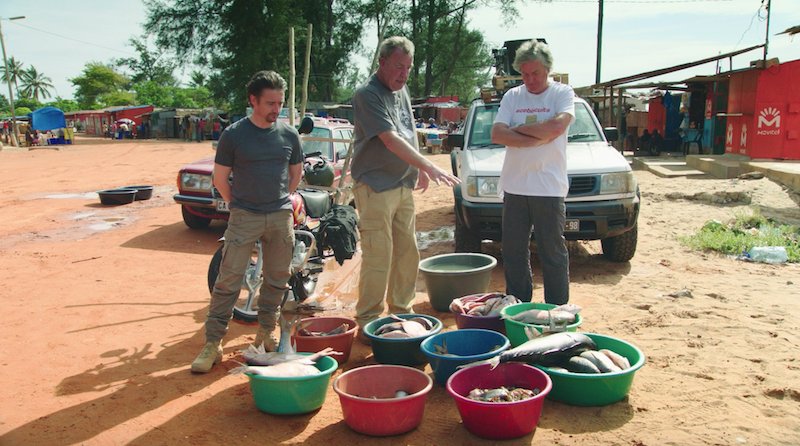 Therefore, Clarkson, Hammond and May set an ambitious challenge to transport fresh fish from Maputo to Bingo. On paper this doesn’t sound very challenging at all, but once you bear in mind that there are 200 miles between the two, you soon to realise the enormity of the task. Although the three of them are working as a team, they all have different means in which to achieve the end goal. May is the first to reveal his car of choice, a Mercedes Wagon from the 80s. 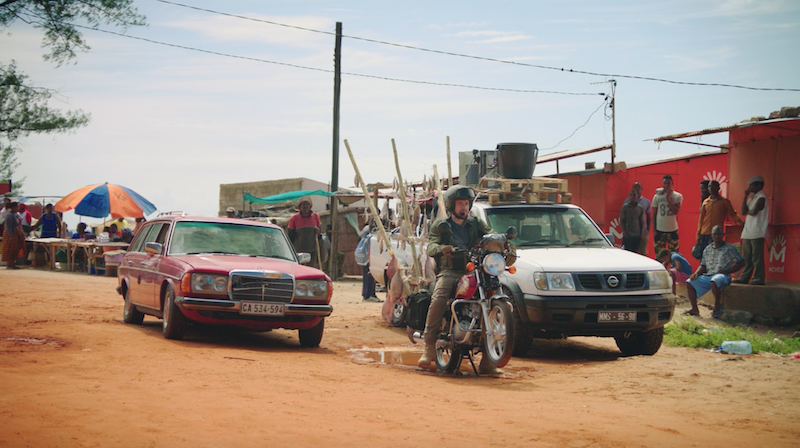 He then states he chose this car because of its dependable nature, and in fact, you may remember he used a similar vehicle in Top Gear’s Botswana special quite a few years ago. How was he to transport his fish to Bingo though? Because it’s an estate, this means fisherman May is able to fit a perspex tank in the rear, which he says, is to be filled with seawater. 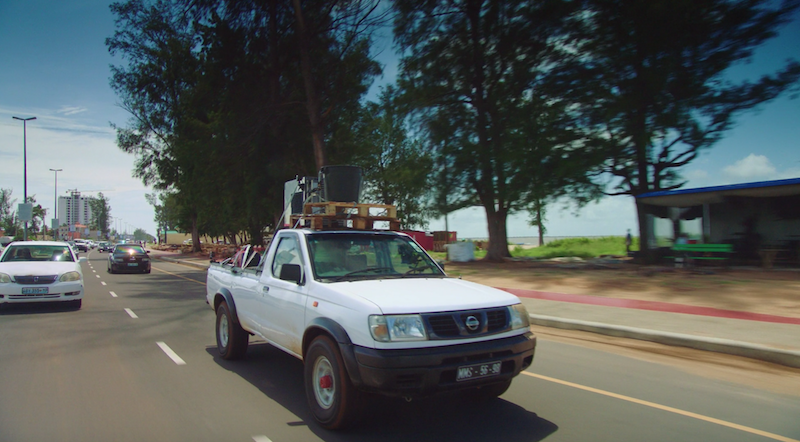 This means he can keep the fish alive and therefore his haul will arrive as fresh as when left Maputo. Rather clever by all accounts, but it’s soon revealed there is a hole in his plan – not as big as the gaping one at the top of his tank though. Before we can get to that though, we join Jezza, who claims that for once in his life, he’s made a sensible decision. There’s strong evidence to back this up as he has got himself a Nissan Hardbody. 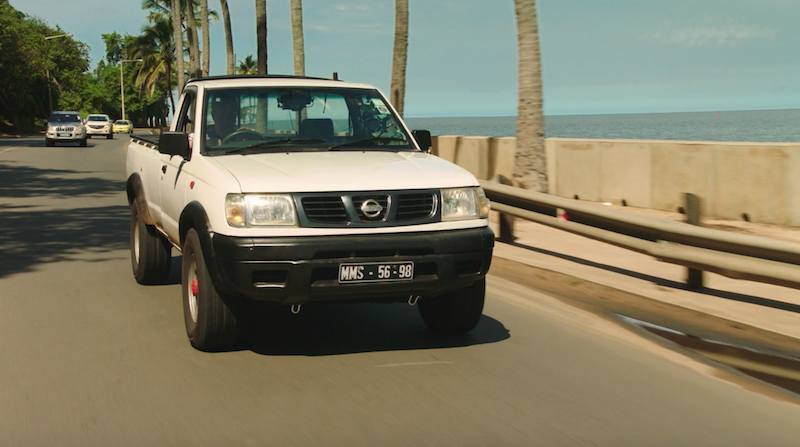 A vehicle that JC claims Nissan named after him. Yeah, if it was done in irony Mr Clarkson ;). His main reason for choosing such a car is because A) it’s a pickup and B) it’s four wheel drive – sensible indeed. 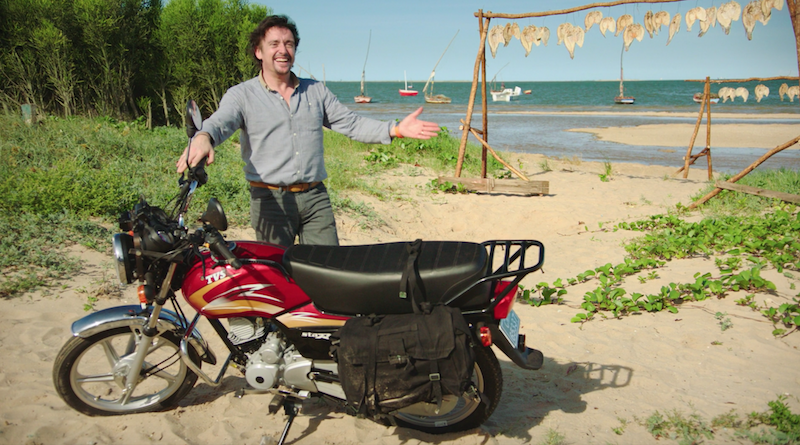 Hammond on the hand hasn’t really been sensible at all, as he’s gone and got a motorbike. Not even a good one – on that he paid £800 for in a supermarket. The Hamster soon explains the method in his madness by stating that he will create a contraption that will dry the fish whilst he drives to Bingo. Right…. At this point you may be wondering what Clarkson’s method is. Well it involves ‘stealing’ an ice machine from a nearby hotel, you get the jist. The next day the trio head to the beach where Jezza sorts out his ‘stolen’ ice machine, Hammond starts building his frankly ridiculous fish dryer and May fills his Merquariaum’. Just by looking at them, it seems pretty impossible that they will be able to feed the film crew, let alone the world. 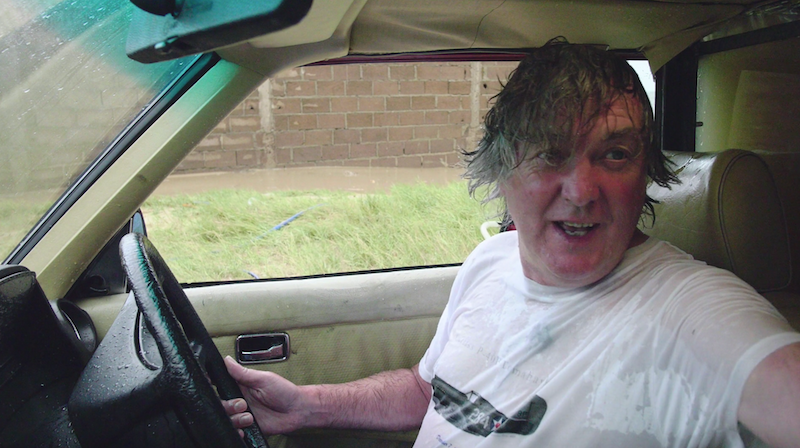 Especially when the added water adds an extra 700kg to May’s Merc, a car that’s not exactly light to begin with. 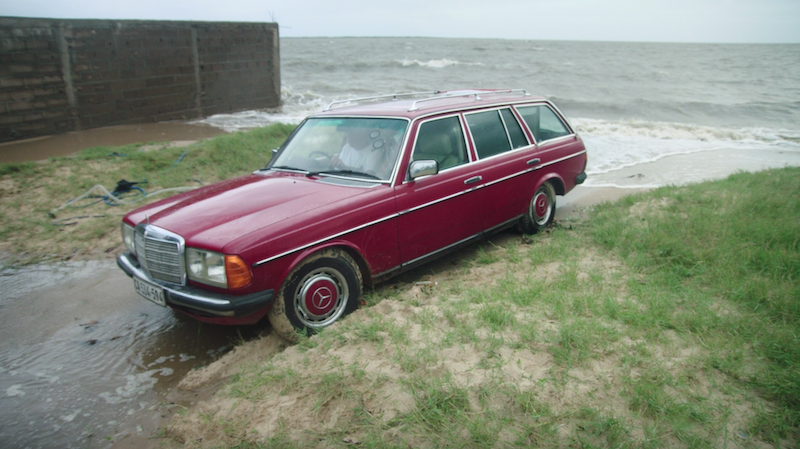 This becomes a problem when it comes to move it as the tide comes in and May needs to move his Merc sharpish. After starting his engine, he struggles to get going and all he does is to cover himself with the water from his own tank. At this point he asks for a tow, but by looking at him, I think he’s more need of a tow-el. Genuinely one of the funniest moments of the episode. 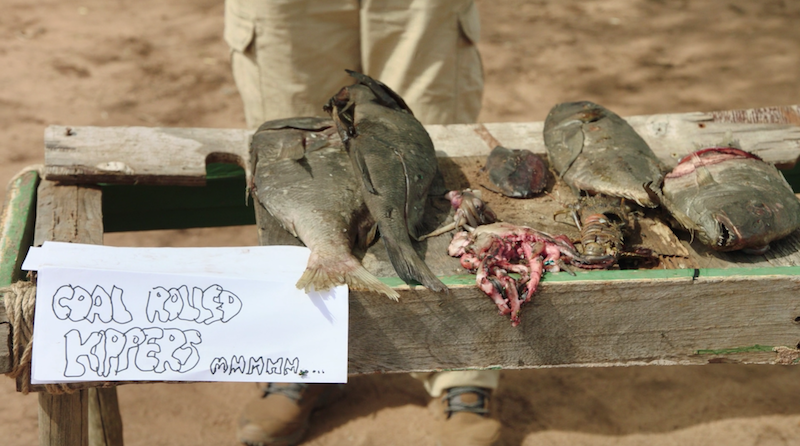 With their methods sorted, the three of them then head out to the sea to catch some yummy and nutritious fish. It’s clear the three of them have very little idea of what are doing – or indeed how deep the sea is – but that of course adds to the hilarity. To their credit, they do eventually catch something, but even that is not quite able to feed the small town of Bingo. After clearing out the local fish stalls and claiming they had caught it, the trio embark on their noble quest. 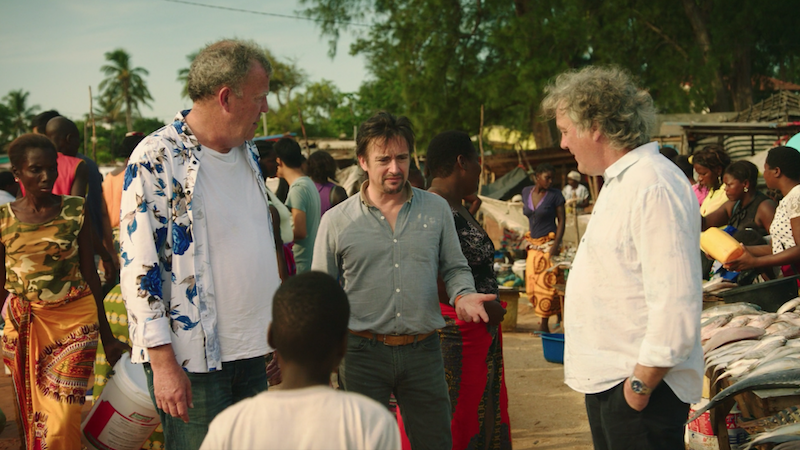 In typical Grand Tour fashion the trio get off to a bad start as Clarkson’ Hardbody has a hard time starting, and Hammond realises that you get what you pay for as his cheap motorbike seems to have a mind of its own. And May? He continues to be soaked by his by his own Merquarium. Needless to say, his driver’s sea-t is not the ‘plaice’ to be. I’m sorry, I couldn’t resist. Shortly afterwards though, all seems well when the three of them hit the tarmac or the highway and things start looking up. Even Hammond’s stupid fish dryer seems to get some admiration from the locals – they must be mad! Clarkson then reckons they will reach Bingo in two hours before proclaiming that it’s the easiest thing he’s ever done – famous last words. In the end, Clarkson gets bored of waiting for the two, therefore he leaves them behind as he desperately needs more water for his ice machine. As night falls he is able to find somewhere in the knick of time, but his two colleagues are far behind. Surprisingly, he waits for them and on day 2 they are back as a trio. 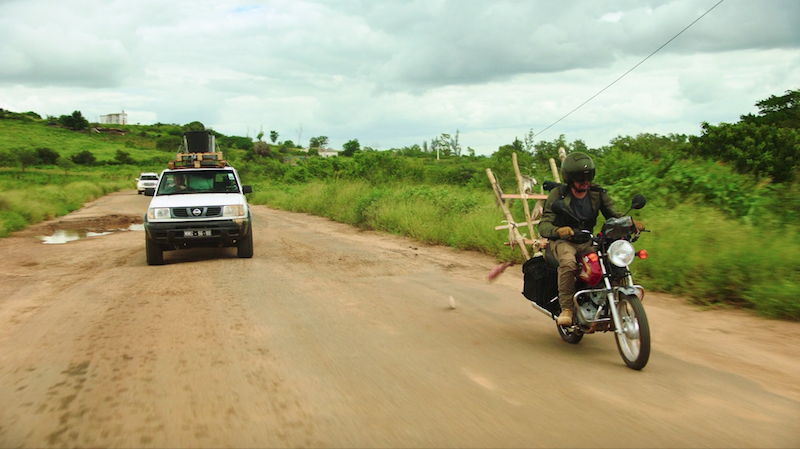 After Hammond has fixed his bike and May has refilled his tank as well as adding some much needed tarpaulin, they head back on the road to Bingo. Hammond continues to fall of his motorbike and although May has fixed his tank issue, his Merc soon has an electrical fire. 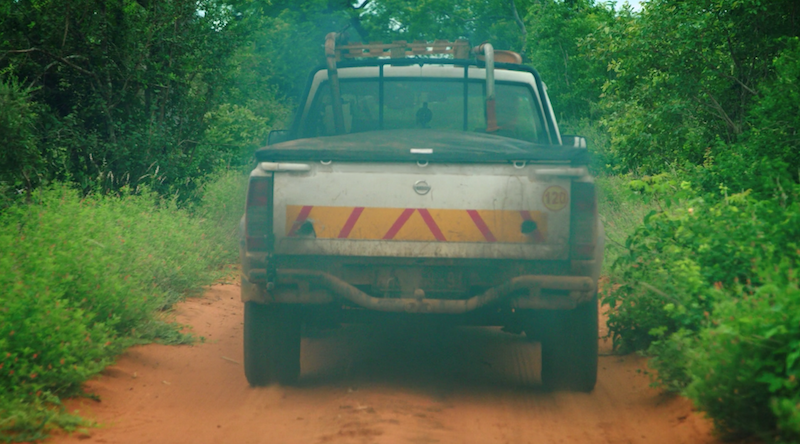 Clarkson also hits problems as his ice solution is now long up to the task, so he decides to ‘smoke’ the fish – with the Nissan’s diesel smoke. Hmmm delicious. Still, at leas he has a decent amount of fish left as Hammond has practically nothing apart from a Mozambique Fresh Water Octopus. Not heard of it? It’s quite famous, but very rare. 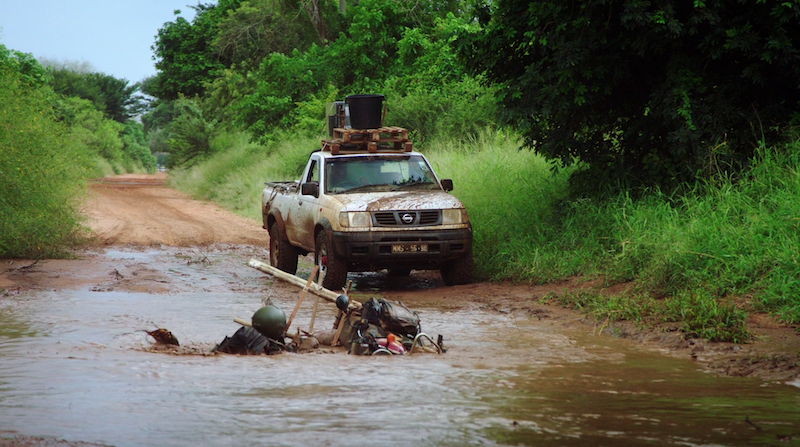 The tables turn as both Hammond and May leave Clarkson behind, but they both soon encounter sticky trails once more. This means it doesn’t take Clarkson too long to catch up, but it means he has to spend much of his time towing May’s ‘Merquarium’ out the mud. Eventually he grows tired of this and simply cuts the car in half to make a rudimentary trailer, much to the annoyance of Captain Slow. To their credit, they do make to Bingo, but the fish they have left to offer is far from enticing. In fact, I think even a homeless person would turn their noses up and the products Clarkson, Hammond and May had to offer. On the whole then, it was ambitious but rubbish. Seems like the world will need to stay hungry for the time being. It may not have been the best special the trio have ever bought to our TV/computer screens, but I found it very entertaining and it had me laughing out loud on quite a few occasions. If you ask me it was a strong way to finish what has been an improved season of The Grand Tour. I will publish a full review of season 2 in the next day or two, so be on the look out for it! Next articleThe Death Of Diesel – Is It True And Is It Fair?